When setting up a hierarchy chain, the parent is usually the part that is at a logical point of rotation. For example, in the case of a leg, the parent would be the thigh, as it rotates from the hip and its children would be the shin and foot that will always follow. 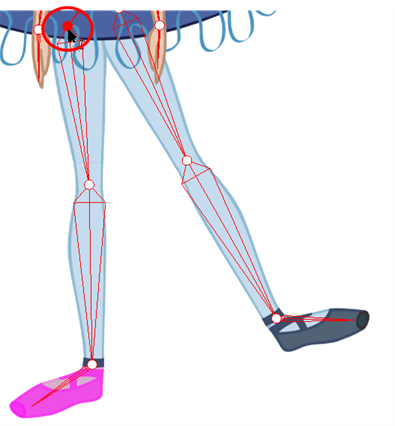 However, sometimes you come across a situation where you need the movement to stem from the child, such as in the case of a ballerina, where the shin and thigh rotation follow the position of the foot. In order to keep the foot from gliding around, making the kinds of secondary movements that children do, you need to nail the foot in place and constrain its orientation (rotation). Sometimes this constraint needs to be held for several frames. In the Camera view, click on the part on which you want to apply the constraint. In the Timeline view, select the first frame on which you want to start applying the constraint. In the Tool Properties view, enable the Apply IK Constraints mode. In the Tool Properties view, click the IK Keyframe button to enter the first frame number. In the Timeline view, move the playhead to the last frame on which you want to apply the constraint. In the Camera view, set a nail at the top of the limb you are correcting. For a foot, set the nail on the thigh by holding down the Shift key and clicking its pivot. In the Tool Properties view, select the type of constraint to apply to the piece. The most common one is a combination of the regular Nail and Hold Orientation options. In the Camera view, click on the bone of the part you want to apply a constraint to. A warning message appears asking you to confirm that you want to add a constraint on that particular piece and for that frame duration.